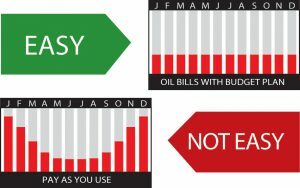 Here at Ormond Energy we know that each customer has different spending goals and payment preferences. Whether you use propane or heating oil, there should be more than just a “one size fits all” solution! This is why we are happy to offer multiple flexible fuel payment options to meet your unique budgeting needs. Enjoy the convenience of predictable and equal monthly fuel bills with our 11-month plan. To calculate your fuel payment, we will determine gallons needed based on your usage history. Then, we will multiply this by a projected price per gallon. This amount will be divided into 11 even payments. After the eleventh payment, there is a one month reconciliation period. Don’t let market fluctuation affect your household budget. When you sign up for Price Cap Protection, we will set a predetermined “cap” price per gallon. No matter how market prices rise or fall, you will never pay more than the agreed upon “cap” price. Take care of your heating fuel in one easy step. Customers that opt for Prebuy option purchase a set amount of gallons in advance with one payment. You can take advantage of available pre-season rates and spend the heating season worry-free. Want to make managing your energy expenses easier than ever? Sign up for one of our flexible payment plans today! Simply contact us here.